Each slow, carefully placed step forces saltwater to ooze from volcano-shaped holes about the size of a thumbnail. Gingerly, Faylla Chapman moves through the mud flats exposed at low tide, heading toward Windy Cove’s temporary shoreline and trying not to lose her shoes in the process. The Morro Bay State Park docent, who was once a biology teacher, has her face firmly focused on what’s beneath her battered beige sneakers. EVER-CHANGING: Just as sand blows off the dunes into the Morro Bay estuary, the bay’s ecosystem is dynamic and always changing based on what’s happening around it. Worms—fat, pink, soft ones; skinny ones with legs like a millipede; and ones with two sharp teeth that once made a student of Chapman’s bleed—clams, shrimp, bacteria, and snails make this sticky segment of the bay home. Each lives beneath a distinctly shaped hole it probes the surface from. If you could sit over the top of this mud at high tide in a glass-bottomed boat, she says, you could see all the creatures moving about. But now, most of them are hiding. “Hey!” somebody shouts a few feet away, and Chapman rushes over, foregoing the threat of a muddied sock for the treat of a biological specimen. Half-in/half-out of a little mud volcano is a ghost shrimp. It’s translucent and the pink of its internal organs are visible. She drops her hand into the briny water covering the hole and gently tugs it all the way out of its home. One paper-white claw makes up half of its roughly 5-inch length. Like a group of school kids, the adults on Chapman’s mud flats tour are crouched low, peering into the water with fascination. 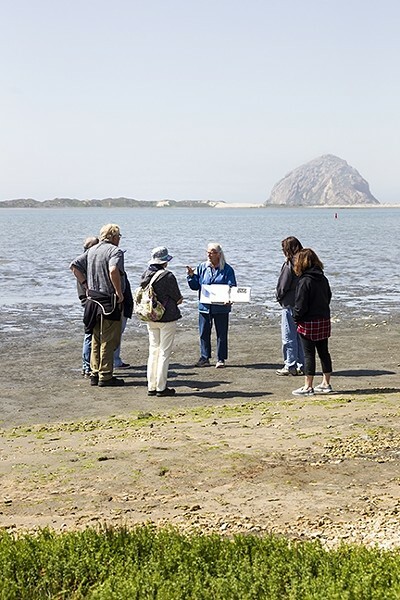 This April 6 walkabout is part of a month-long series of tours and hikes organized by the Morro Bay National Estuary Program to go with the release of the 2017 State of the Bay report. Earlier, Chapman had plucked a plum-sized bubble snail from the muck—sniffing the opening of its purplish shell and wrinkling her nose at the scent. That rotten-egg smell came from deep down in the mud. It’s a smell you can’t get out of your clothes for days, she said, referring to the holes she’s bored into the muck while searching for life. According to Chapman, that sulfur originates within eelgrass, a foundation of the Morro Bay ecosystem that has declined rapidly over the last decade. After eelgrass dies, it decays and the sulfur it contained is gobbled up by green bacteria, which are the basis for everything above them in the food chain. She pointed out a dark patch of water in the bay, saying with surprise that it looked like a new eelgrass bed that didn’t exist last year. It’s a sign that maybe the brine-water loving plant—which has lost more than 95 percent of its Morro Bay foothold in less than a decade: from 344 acres in 2007 to merely 13 acres in 2015—has a chance for survival. The grass is a flowering underwater plant that grows in shallow areas of the estuary, where the water is clear and light is prolific. “While we do not yet know the exact reasons for the decline, it is likely the result of multiple factors,” the estuary program states in the recently released report. And without knowing the exact reasons for the huge losses, its hard to pinpoint what will help bring some of it back and how to prevent staggering declines from happening again. But the program’s executive director, Lexie Bell, said the estuary program is working with stakeholders, government agencies, and Cal Poly to do more research that will help adaptively manage eelgrass and Morro Bay in the future. Without eelgrass, Morro Bay would be a much different ecosystem and some of those changes are already starting to show. One of the most visible changes related to eelgrass decline is the number of brant (also called the Western brant or black brant) using Morro Bay as a feeding and resting spot on the Pacific Flyway. Dave Tyra, president of the Morro Coast Audubon Society, said brant, a goose that’s about the size of a mallard, typically use the estuary as a stopover on their migration between summer nesting sites in northern Alaska and Canada and wintering sites in Baja California. Tyra pointed out that the annual Christmas Bird Count pegged the number of brant hanging out in Morro Bay on Dec. 16, 2006, at more than 3,000 strong. By Dec. 17, 2016, that number had fallen to less than 500. INTERCONNECTED: As eelgrass acreage declines in the Morro Bay estuary, sightings of the brant—a goose that migrates between Baja and Canada and feeds on the grass—are less frequent. Eelgrass is the brant’s main source of food. According to Ed Miller and Fred Harpster—respectively, the vice president and president of the Black Brant Group in Morro Bay—the goose still feeds in the thousands on coastal bays that have plenty of eelgrass in them. But the loss of eelgrass in Morro Bay is troubling to them. The Black Brant Group has been around for about two decades, and it was started as a way to push back against “anti-hunting pressure,” Harpster said. Waterfowl hunters used to be able to hunt throughout the bay, but legal hunting areas have slowly been whittled away to 30 percent of what they once were. The group has spent about $450,000 on various research projects since it started and raises money through its once-a-year dinner. The funds have often supported projects that study the brant (such as habitat changes in Alaskan nesting areas), but more and more, that money is also going to eelgrass research. Harpster said he started hunting in Morro Bay with his father in the 1950s, and the bay has changed dramatically. Eelgrass is also a haven and nursery for fish and shellfish. It cleans excess nutrients such as nitrates out of the bay. Its root system acts as a stabilizer for the bay’s soft floor, preventing sediment from moving around and allowing more light to filter through the water column. ADULT LEARNING: Morro Bay State Park docent Faylla Chapman uses her binder full of maps, diagrams, and fun facts to educate people about the history of Morro Bay, changes to the estuary, and all the things that call it home. But eelgrass is also an extremely sensitive species that can only grow in specific environments. Available light, the saltwater/freshwater mix, water clarity, water temperatures, tide flows, and elevation within the estuary can all affect eelgrass’s chances of survival. The National Marine Fisheries Service (NMFS), a department within the National Oceanic and Atmospheric Association, estimates that fewer than 11,000 acres to as much as possibly 15,000 acres of eelgrass habitat exists statewide. Stakeholders like the Morro Coast Audubon Society, the Black Brant Group, and the Morro Bay National Estuary Program have pooled their resources (money and people power) together to do things to try and stem Morro Bay’s rapid eelgrass decline. Working in conjunction with state and federal agencies such as the California Department of Fish and Wildlife, the group spearheaded a huge eelgrass replanting effort starting in 2012. And although the majority of those blades didn’t make it past year two, Bell with the estuary program believes the effort wasn’t for naught. The method they used, basically transplanting whole plants with roots intact, has worked in other areas of the bay before—it just didn’t necessarily take off in the new areas. Or to say, what works over there isn’t necessarily going to work over here, because the conditions of the bay are different from south to north, east to west. Keith Merkel with Merkel and Associates out of San Diego helped with the most recent efforts and also spearheaded the successful efforts that took place as mitigation for dredging in other parts of the bay. Since the 1980s, Merkel has worked up and down the West Coast in research, restoration, and mitigation of eelgrass in various bays. Currently, he’s part of a big project in San Francisco Bay, which has seen eelgrass declines as well. “I would say that Morro Bay has been hit worse than any other system along the coast, but all the systems along the coast have in the past several years become unstable relative to eelgrass distribution,” Merkel said. His best guess as to why? A wasting disease caused by a pathogen that normally exists in eelgrass beds, but he cautions that trying to pinpoint something as the root cause is like asking whether the chicken or the egg came first. He compares the eelgrass pathogen to the bark beetle and what it has done to forests from the Rocky Mountains to the Sierra Nevada over the last few years. 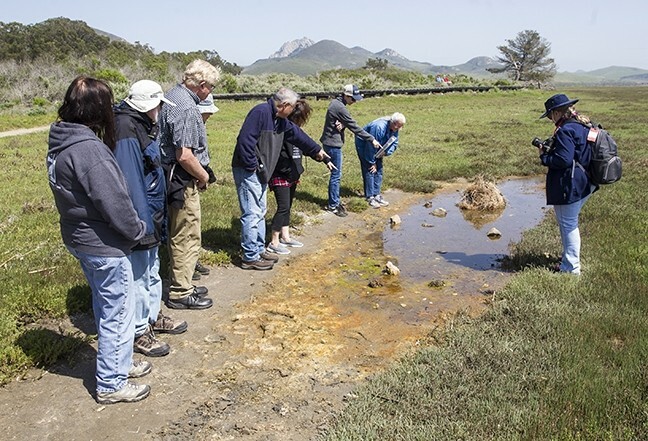 ESTUARY GAWKIN': On the tail end of a docent-led walk from the salt marsh to the mud flats near Morro Bay State Park on April 11, walk attendees check out the creatures that call a salty pond home. Beetles normally exist in the environment and pine trees can usually resist their impacts, but stressors such as higher temperatures and prolonged drought can decrease a tree’s strength and therefore its immunity to the bark beetle. Merkel said the same can be said of this pathogen and eelgrass, especially in Morro Bay. Things like less fog and cloud cover over Morro Bay, higher temperatures, and less storm water flowing down the watershed stressed out the eelgrass, lowering its immunity to the pathogen. All of the factors that eelgrass helped control—keeping sediment on the bay floor and the water clear, sucking up extra nutrients out of the water and helping to prevent large algae blooms—are no longer restrained. And it becomes a vicious cycle, because eelgrass has a hard time surviving in murky water with low light. That being said, Merkel did some eelgrass monitoring in the bay in early April. He noticed spots of new eelgrass growth in areas that had initially benefited from transplant efforts but eventually died off. To truly understand why eelgrass died in the first place and why there are glimpses of it returning, the estuary program feels it needs to better understand Morro Bay and how it works, in general. As the die-off started to threaten an end to Morro Bay’s eelgrass beds, the estuary program looked to Cal Poly for help finding answers. Bell said the relationship with the university is a first for the estuary program. Jennifer O’Leary, a marine scientist who’s an adjunct professor at Cal Poly through the California Sea Grant program, is spearheading some of the efforts. She said they are studying a few small plots of eelgrass they planted in different areas of the bay, as well as the water and sediment dynamics in Morro Bay, oxygen levels in the water, and how fish interact with eelgrass. EXPLORE THE BAY: The Morro Bay National Estuary Program has events running through the end of April, including an Earth Day paddle and shoreline cleanup at Tidelands Park on April 22 from 8 to 11 a.m. Visit mbnep.org to learn more. Sedimentation is the theory O’Leary and her team of researchers is testing. 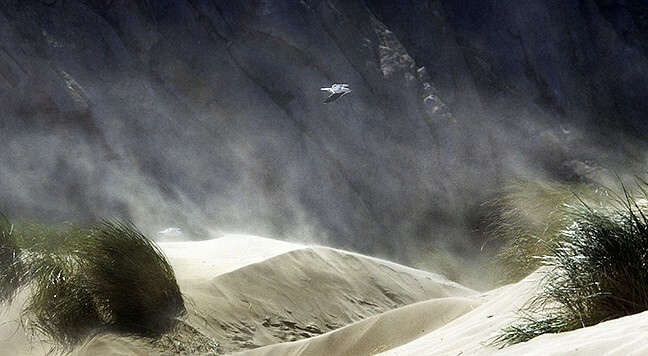 Essentially, the thought is that how much sediment—dirt, dust, mud, sand—runs down from the watershed or blows off the dunes and where it ends up settling in the bay could affect eelgrass growth, as could the amount of that same sediment clouding up the water (turbidity). But all of this research is being done after the die-off. “One of the hardest parts of this is we’ve sort of become ecosystem detectives,” O’Leary explained. The goal is to get a more holistic view of the bay and use all the data they’re collecting to create a map of what the bay looks like: where sediment is deposited and eroding; where eelgrass is now and where it’s occurred in the past; how water moves in and out of the bay from land and sea. Eventually, that model could be used to help manage the bay, re-establish eelgrass, and potentially prevent massive die-offs in the future. Although the research team is building off the estuary program’s past efforts and has already started filling in data points of their own, more research is needed. O’Leary recently submitted a grant proposal to receive more funding for that work. One of those grant sources will hopefully be California Sea Grant, which also funds her position at Cal Poly. The National Sea Grant is run by the National Atmospheric and Oceanic Administration (NOAA). Individual programs are run in the 33 states that touch either saltwater or the Great Lakes, doing research on problems that stem from human interaction with the ocean, according to California Sea Grant Director Jim Eckman. The $72 million Sea Grant program is on President Donald Trump’s chopping block as a future budget cut, as is a 17 percent cut to NOAA’s overall funding and a 31 percent cut to the Environmental Protection Agency’s (EPA) federal funding. Being an EPA-designated National Estuary Program enables Morro Bay’s estuary program to get funding. It receives about half of its money from the EPA each year. Eckman said cutting the Sea Grant program would save the feds about $4 million when it comes to California but would cost the state an additional $12 million to $18 million in matching grants and other funding sources. But he’s confident that the legwork Sea Grant has done in Washington, D.C., and in each of the states the program touches will pay off. Eckman said there have been letters written by senators and representatives on both sides of the aisle asking the budget committees to maintain the Sea Grant program at its current levels. He’s optimistic, but they’re still encouraging people to make their voices heard. Editor Camillia Lanham dreams about being a scientist, but didn’t do well in high school biology. Reach her at clanham@newtimesslo.com.